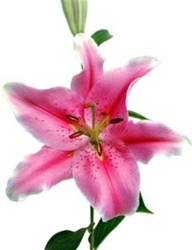 The Sorbonne Oriental Lily has a stylish composition of pale pink petals finishing in a thin white ruffle, accented by darker pink center line and freckling. The Sorbonne has a pronounced three-pointed chartreuse star in center, chartreuse pistil and filaments, burgundy pollen. Stems 26 to 36 inches. We guarantee freshness. Free shipping! With proper care, they can last 7 to 10 days or more. A few hours after hydration, they will perk up and look dramatically different. You can speed up "cracking" by puttingthem in a window to get sunlight, but be careful you don't overdo it! You can also help open the blooms at the tip by slightly pulling them apart. After having your Lilies in a vase with water for approximately 1 day and you are ready for the blooms to open. Take the bloom and roll between your hands, applying LIGHT PRESSURE. (This is similar to rolling a pen between your hands.) You should continue to do this until you begin to see the bloom open. Once you see the slightest bit of the flower begin to open STOP rolling and leave the flower to open naturally. Stylish composition of pale pink petals finishing in a thin white ruffle, accented by darker pink centerline and freckling. Pronounced three-pointed chartreuse star in center, chartreuse pistil and filaments, burgundy pollen. Stems 26 to 36 inches. Oriental Lilies are shipped in 10-stem bunches, bundled together by a rubber band, packed in a cardboard or plastic wrap for protection. Each stem has 2 -5 large blooms that face upward from the center.Expected minimum vase life is 8 days. Life expectancy is influenced by temperature. Cooler temperatures result in longer vase life. Colors may vary with climate, season and your monitor resolution. Year round availability. Prices are based on availability and are subject to change due to weather and market conditions.